Makerere University, through the MasterCard Foundation is offering full scholarships to young African undergraduates to educate and empower the next generation of African leaders at Makerere University. Eligible Countries: Citizens and residents of all African countries. 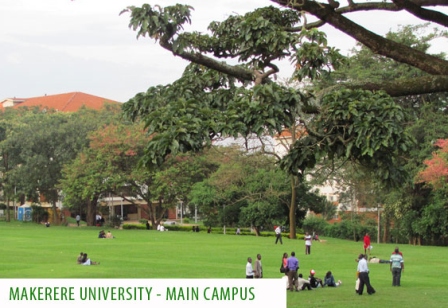 Eligible Field of Study: Applying to study in the preferred fields of Agriculture, Veterinary medicine, ICT, Health Sciences, Technology and Engeneering, Law and Human rights and Business and Financial Management at Makerere University. About Scholarship: Makerere University has partnered with The MasterCard Foundation (MCF) to support 1,000 academically bright but economically disadvantaged youth from Africa to access quality university education from 2014 to 2024. The MasterCard Foundation Scholars Program at Makerere University is pleased to announce 200 scholarship opportunities for both national and international students who will be joining the University in the academic year 2017/18 for undergraduate education. Applicants must apply for admission to Makerere University main campus only for academic year 2016/17 on private scheme. The applicant should be admitted on direct entry (using UACE results) or its equivalent for international applicants. The applicant must be from an economically disadvantaged background, and a citizen of any country in Africa. The applicant should exhibit academic excellence in either Sciences or Arts with a minimum of 15 points for boys and 13 points for girls at UACE for Ugandans, and two principal passes in relevant subjects for international applicants. Those who studied sciences have an added advantage. The applicant must demonstrate leadership skills, commitment to social betterment and giving back to their communities. The applicant should not have been admitted on government or be holders of any other scholarship. All prospective Scholars must first be admitted to Makerere University to be considered for the Scholarship. Number of Scholarships: 256 for 2017/2018 academic year and a total of 1,000 students through 10 year period of the scholars program. Submit completed Application Forms to the address in (1) above by Friday 28th April 2017 at 5:00pm. If submitting by email as an attachment, ensure the scanned copy of the scholarship application form is clearly legible and send to: info@mcfsp.mak.ac.ug. Important Notes: This program exercises merit principles and zero tolerance to dishonesty. Any form of influence pedaling by anybody leads to automatic cancellation. Cases of impersonation, falsification of documents, giving false and incomplete information whenever discovered will lead to automatic cancellation and or prosecution in the courts of law of Uganda. Only successful applicants will be contacted at every stage of the application process. Start your application now. Now that all the information about Makerere University MasterCard Foundation Scholarships for African Students has been delivered nicely; talented students who are eager to pursue their Free Tuition/Scholarships/Study in Uganda for Undergraduate, Bachelors, Postgraduate, Masters, PhD, Associate Degree and Other Degrees, can apply now.